This interview with Ron Kaufman was written by Preeti Dawra and published MintAsia. Do cultures differ in how they define and deliver service? Different countries have different service standards and expectations. For example, Americans tend to be gregarious and outgoing while the English tend to be more conservative and reserved. These are cultural standards that shape different expectations. So are some cultures better at delivering service than others? The answer to this question is not in the standards or expectations of the country but in the country’s willingness to be curious about and sensitive to what other people truly appreciate. What do you make of India’s service culture? It is good but can be much better. The key question is whether Indian service providers can become more curious about their customers, more open to learning about their customers, more sensitive to their customers’ wants, needs, and expectations. Are Indian service providers willing to adapt and adjust the service they provide to deliver something the customer truly appreciates or values? When you look at service in this way, India has a tremendous service potential for the future. What do you see as India’s biggest hurdle in becoming a world class service provider? 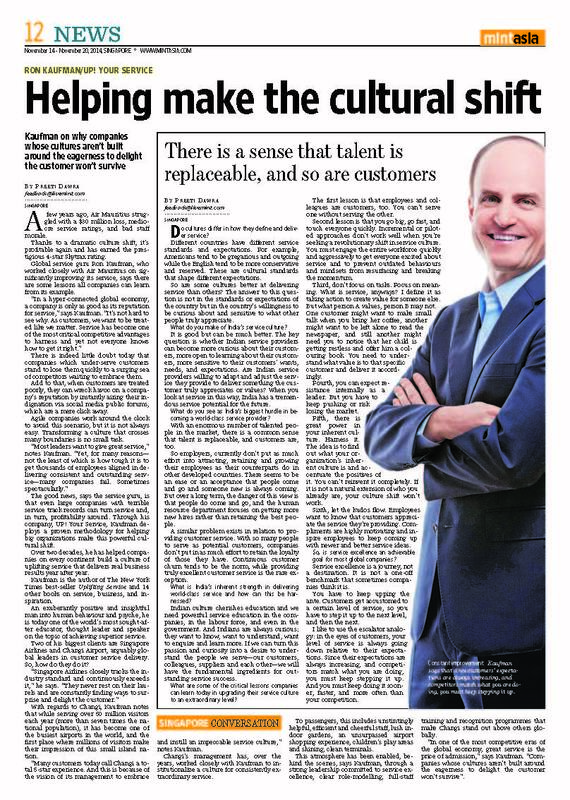 With an enormous number of talented people in the market, there is a common sense that talent is replaceable, and customers are, too. So employers currently don’t put as much effort into attracting, retaining and growing their employees as their counterparts do in other developed countries. There seems to be an ease or an acceptance that people come and go and someone new is always coming. But over a long term, the danger of this view is that people do come and go, and the human resource department focuses on getting more new hires rather than retaining the best people. A similar problem exists in relation to providing customer service. With so many people to serve as potential customers, companies don’t put in as much effort to retain the loyalty of those they have. Continuous customer churn tends to be the norm, while providing truly excellent customer service is the rare exception. What is India’s inherent strength in delivering world class service and how can this be harnessed? Indian culture cherishes education and we need powerful service education in the companies, in the labour force, and even in the government. And Indians are always curious; they want to know, want to understand, want to enquire and learn more. If we can turn this passion and curiosity into a desire to understand the people we serve—our customers, colleagues, suppliers and each other—we will have the fundamental ingredients for outstanding service success. What are some of the critical lessons companies can learn today in upgrading their service culture to an extraordinary level? The first lesson is that employees and colleagues are customers, too. You can’t serve one without serving the other. Second lesson is that you go big, go fast, and touch everyone quickly. Incremental or piloted approaches don’t work well when you’re seeking a revolutionary shift in service culture. You must engage the entire workforce quickly and aggressively to get everyone excited about service and to prevent outdated behaviours and mindsets from resurfacing and breaking the momentum. Third, don’t focus on tasks. Focus on meaning. What is service, anyways? I define it as taking action to create value for someone else. But what person A values, person B may not. One customer might want to make small talk when you bring her coffee, another might want to be left alone to read the newspaper, and still another might need you to notice that her child is getting restless and offer him a colouring book. You need to understand what value is to that specific customer and deliver it accordingly. Fourth, you can expect resistance internally as a leader. But you have to keep pushing or risk losing the market. Fifth, there is great power in your inherent culture. Harness it. The idea is to find out what your organization’s inherent culture is and accentuate the positives of it. You can’t reinvent it completely. If it is not a natural extension of who you already are, your culture shift won’t work. Sixth, let the kudos flow. Employees want to know that customers appreciate the service they’re providing. Compliments are highly motivating and inspire employees to keep coming up with newer and better service ideas. So, is service excellence an achievable goal for most global companies? Service excellence is a journey, not a destination. It is not a one-off benchmark that sometimes companies think it is. You have to keep upping the ante. Customers get accustomed to a certain level of service, so you have to step it up to the next level, and then the next. I like to use the escalator analogy: in the eyes of customers, your level of service is always going down relative to their expectations. Since their expectations are always increasing, and competitors match what you are doing, you must keep stepping it up. And you must keep doing it sooner, faster, and more often than your competition.